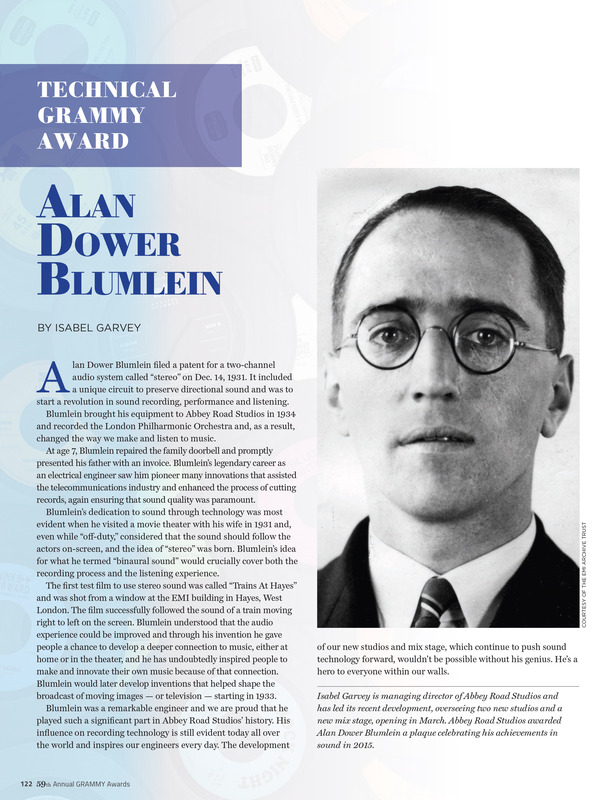 Last weekend's 59th GRAMMY Awards ceremony saw the announcement that ex-EMI engineer Alan Blumlein will be posthumously awarded a Technical Grammy for his work in transforming the way that we listen to music, through the invention of "stereo" in the 1930s. The award will be presented at a special ceremony later this year. As the location of many of Blumlein's earliest experiments with stereo recording, Abbey Road was to play a massive role in this defining moment in audio history, and to celebrate the announcement Abbey Road's managing director Isabel Garvey wrote the below, which featured in the award ceremony's official programme. Isabel Garvey is managing director of Abbey Road Studios and has led the recent development, overseeing two new studios and a new mix stage, opening in March. Abbey Road Studios awarded Alan Dower Blumlein a plaque celebrating his achievements in sound in 2015.